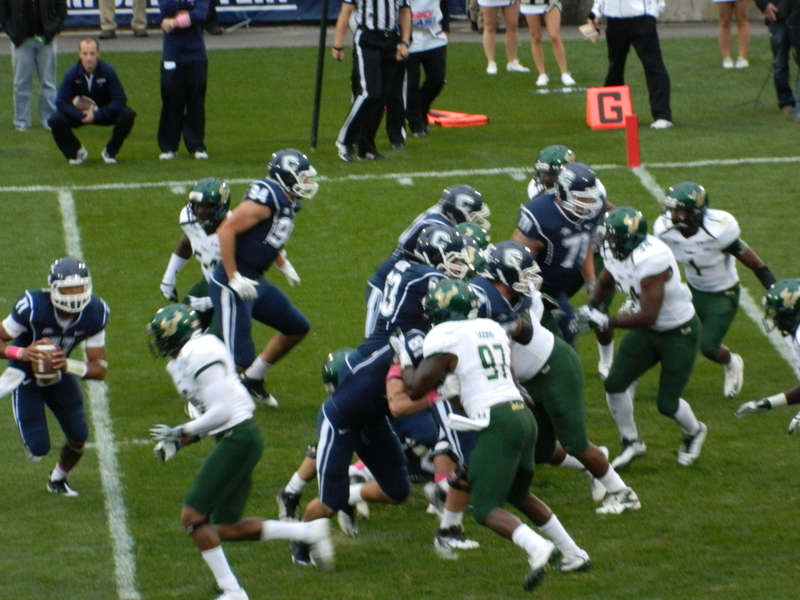 The 2011 University of Connecticut homecoming football game win was a welcome victory amidst continued uncertainty about the future of the Big East Conference. UConn came up with a 16-10 W, in the October 15 game against South Florida at Rentschler Field in East Hartford, Connecticut. Two days later presidents and chancellors from the Big East universities voted unanimously to double the exit fee to $10 million for football schools to leave the conference. It is a vote which came on the heels of a turmoil creating announcement that Pittsburgh and Syracuse will drop out of the Big East to join the Atlantic Coast Conference – ACC. Speculation is that revenue and dominance were motivating factors in the move that dilutes the Big East, now shopping for prospects in order to expand to twelve football schools. The question remains if UConn gets an invitation to join to the ACC, would it be accepted? It is hard to wrap my head around where my little $45 ticket plays into this high stakes scenario. That said- in all honesty, the increasing visibility of the Huskies on the national stage is alluring. However, as a UConn alum, I plan to attend games regardless of what conference the team is in. There is nothing quite like a Saturday football game on a clear, crisp autumn afternoon, donning corduroys and wool sweaters for a tailgate before proceeding inside the stadium. Time was in addition to the traditional plaid blanket, it was alright to bring a thermos of hot chocolate – that was at Memorial Stadium in Storrs. And, where is the confetti that used to be tossed to celebrate a touchdown? Ah, the good ole’ days. Simpler times. Truth is, times were never simple. It is a safe bet at every level, every twist and turn along the way, intrigue has played out behind-the -scenes. In this latest drama, one can only hope for UConn to remain a player with principles and integrity. Otherwise, what is the point?